Ok guys new to the forum but need some guidance. I just recently put together my old 1985 atc 200x. I went completely through the top and bottom end. New seals, new kickstart ratchets, new gaskets. I replaced the ignition and lighting coils with ricky stator ones new. New ebc clutch with 10% extra power springs. The jug. The cylinder is bored to 66mm, wiesco 12.1 to 1 high comp piston. Then installed new valves, lapped for the head, and installed a web camshaft 214 profile cam with performance valve springs. All new gaskets on the top end. Reassembled and set the valves according to spec. Set the pulse generator to .012 according to the book. So after getting everything back togather tested it. The compression is 120-130 psi. However I cannot get it to start or hit over. I tried to see if i had spark but I cannot verify it so far. The carb has a 132 main jet in it, and fuel is getting to the carb, runs out the drain when you turn the drain screw. The carb is also completely clean inside, went through it before reinstalling it. I also tried to spray a little ether in it to see if it was a fuel issue, but still no hit over. I have kicked this thing until my foot is sore. So what do you guys think. Where should I look next? I checked my wiring and everything appears good, no loose , or damage. Im stumped, and any help would greatly be appreciated. You need to know if it’s firing before you go any further. Pull the plug, stick it the wire and lay it on the head. Being a kick start you may have to have a friend watch for spark while you do the stomping. From there you can track it down. Post what you find. There’s still a few around here that post often. Not as many as there oughta be but enough to help with a 200x. Can’t be that much. Ain’t much there for wiring if that’s what it is. I was thinking that, just needed reassurance. I am gonna try and check it tomorrow, and see what happens. Way before this build many many years ago, this thing was always hard to start kicking it. I had a 1986 xl 600r that wasn't as bad as this 200, however it did have a compressiom release. So if its the spark, what would be the next step? I do have a spare oem cdi box, spare complete wiring harness, and coil. Before I resurrected it the last time I ran it was 2007. I am anxious to get her moving again. Yup. Got to know if you are getting spark. First I would check the kill switch. Is it on? Trust me I have seen it... Next I would check the contacts inside the switch. So I messed with a bit tonight. I checked and I am not getting any spark, that I can tell. I then added a new ngk DR8ES-L plug, no change. I swapped out the wiring harness with the backup, swapped the coil to the backup, and cdi box to the back up. All connections are good. Still no spark. SO I then cleaned the handlebar switch and checked for any visible problems, none found. So I am thinking that its either the handlebar switch, the pulse generator, or the ignition or lighting coil I installed from ricky stator. I did solder in the new coils and protected the connections with heat shrink. I have no clue what to try next really, what do you guys think? Here are the pictures. A quick thing to do is make sure that coil is grounded good. I don't rely on the screws doing it. I sand the frame a bit and also the coil where it mounts to the frame. While you have it off. Clean up that connection on the right in the first picture. You can just disconnect the handle bar switch to rule that out . I would ohm text the stator as well . Make sure the coil is making metal to metal contact to the frame , same with the motor at least at one motor mount . Will check the ground for the coil tomorrow. I did remove the paint from the frame before mounting the coil. The front mount was broken off so I made a new one with a piece of metal and attached it by using a self tapping screw. I am gonna remove it and clean it up tomorrow too. The rear one appears to have been broken in the past and crudely welded back on. I am also gonna check the motor to frame grounding which I am sure could be improved after the primer and repaint. Is their a better way to ground the motor by using other means like was used on later honda's? I also checked the ohm reading to the book values and did not get what the book lists, however I am not that great with a multimeter. However I do remeber checking the stator coil and lighting coil with the meter set to ohms and red on the wire, black on the bare frame and got no reading, or zero, so that could be the problem the motor is not grounded to the frame, and plug coil as well. Thoughts? Thanks for the help, I deeply appreciate it. Last edited by Tacky; 12-27-2018 at 11:39 PM. Will it run without the handlebar switch connected into the wiring harness? What were the ohm readings for the coils? red vs black probs pretty much doesn't matter when you're doing ohms testing, the coil has no positive or negative side (it generates AC anyway). One tip on the multi-meter use, don't use it like a test light, not everything is grounded the the engine on every machine. The probes have to be able to make a full loop in the circuit to get readings. For the multi meter settings, generally there's 200, 2k, 20k etc. This is the range the multi meter will read in ohms (k = 1000, like 20k = 20,000). You can take readings in higher settings, but they are less accurate. Like if you're reading the pulse generator which should be 50-150 ohms, you want to be on the 200 setting. Letting us know the readings can help diag if it's a bad part, or just lightly out of spec. With aftermarket parts, they might be off a bit (higher ohms) for higher output. Also worth noting the pulse generator doesn't internally ground, so you must take the reading at the two wires coming out of it. You can also test the ground connection with a multi meter. Put one probe at basically any green wire on the harness, and the other on a clean spot of the engine. Should read near 0 ohms. The harness only has one ground location, and that's right at the coil. I scanned over the wire diagram, and the alternator and exciter coil both are internally grounded, so testing yellow wire to ground for lighting coil, and black/red to ground for exciter coil. Lighting coil should be near 0 ohms, I think most other machine it specs like 0.1-1 ohms. Exciter coil should be 100-400 ohms (2k range). I hate to say it this way, but throwing a bunch of parts at it all at once is generally a bad idea, just for the fact you don't know exactly what change is causing the problem now. New parts can be bad out of the box etc. It seems it's quite often harnesses are shotty at best being so old. If it's stiff, brittle, or falling apart it should be replaced. I'd say get it atleast sparking before replacing it though if it's showing signs of being old. Not to plug my own product, but I do make harnesses, I suspect the aftermarket CDI uses the 4+2 style connector (modern) instead of the odd ball 3 & 4 pin connectors. Electrical stuff to the side. The engine's compression sounds low to me, but then again, it's a fresh bore and such so probably not going to be great till it breaks in. OEM sped for compression is 165psi when it was 9.6:1. I'd think 120psi or so should be enough for it to run though. We almost need a diag kit to send around with a deposit to get quality test equipment to people needing to diag problems. Reading peak voltage of the exciter and pulse generator would say for sure if they are atleast working or not, ohms testing does pretty good though. Spark quality is normally measured with a special tool that makes the spark jump around 6mm, if it can't jump the gap, it won't spark while under compression. Anyway, like others have said, there's not a whole lot for electrical on these machines, so my focus would be the power/signal sources and moving up stream (CDI/Coil later). Also, it's worth while testing the multi meter for accuracy, not the perfect test, but you should be able to touch the probes together and get 0.00 ohm reading at 200 setting. I had a guy recently with a cheap harbor freight meter that read 0.6 ohms, and when I had him test the ignition coil, it was out of spec, the 0.6 off the reading put it within spec though. Yes it will run without it connected . Ok so here it was I did today. I removed the ignition coil and tested it off the bike. Primary coil is 0.4 ohms, secondary coil is 4.21k ohms according to the meter. Factory manual says its in specification. I removed the top and front motor mount, and removed the paint down to the metal, same to the motor, and reattached them. Also did the connections under the ignition coil under the 2 mounting bolts, and where the trigger small wire slides on. Then reinstalled. I then unplugged the wires to the lighting coil and exciter coil, the red and black, and yellow. I hooked the meter to the lighting coil and got a reading of 0.0 ohms. Then the exciter coil, reading of 0.0. I had the red lead from the multimeter on the wire, and black on the bare metal where the gas tank rear bolts go in. I then reattached the exciter and lighting coil wires back into the harness. I rotated the engines flywheel to the fire mark. I inserted the red wire from the multimeter into the yellow wire at the connection and grounded the black and got a reading of 0.778K ohms. I did the same for the lighting coil and got a reading of .010 ohms. I also tested the cdi by testing the blue and green wires and got a reading of 88 ohms, which is ok according to the factory manual. So does this give you guys any clues in diagnosing the issue? I agree that its not a good idea to just throw parts at it, since it makes it harder to diagnose a problem. I only replaced the parts I knew needed replacement. Reason I did the lighting coil is that the headlight was really dim when it ran years ago. Just replaced the excitier coil since I was already doing the lighting coil. The rest of the parts, cam, valves etc, were to replace worn out parts that did not meet the factory specs for minimum and maximum limits. You know the thought had crossed my mind, what if I need to unbolt the cam sprocket, rotated the motor 360 degrees and re bolt it back on. I don't think you can bolt the cam sprocket on 180 degrees off, pretty sure the bolts are off centered slightly so it only goes on one way. For the lighting coil issue you had in the past, did you try a new bulb? They get dim with age xD. Testing voltage would probably been a good test before swapping them out, never know it could have just been a bad ground. Anyway, lighting coil spec is connection to ground, so even 0 ohms should be within spec. Most multi meters are not super accurate around 1 ohms and lower anyway. Not sure why you tested between the yellow and black/red, neither is a ground, green is ground on Hondas (generally). Anyway, what you did was test lighting coil + exciter coil in series which doesn't make much sense since before you got a read of 0? 778 ohms is really high, exciter on it's own should be 100-400 ohms. I attached a cheaply edited photo to visualize the test you did to help show what you measured exactly. Not trying to bash your mistakes or anything (maybe I'm just misunderstanding it? ), I'm sure a lot of people could use a little help to grasp the idea of a multi meter. If you perform this test again with one lead on black/red and the other on engine in the 2k range, it should read about the same, never hurts to double check. You're testing the coil's resistance, so be sure they are unplugged and you're reading the engine side of the wires. The other end goes to the CDI and would screw with the readings. Also worth a mention, this engine doesn't have points, so rotation of the engine doesn't effect the ohms readings, unless the movement/vibration is making it get/loose connection like a bad wire. I assume by testing the CDI you mean the pulse generator that's located under the cover that's embossed with CDI (silly placement by Honda). The CDI is a black box under the gas tank. 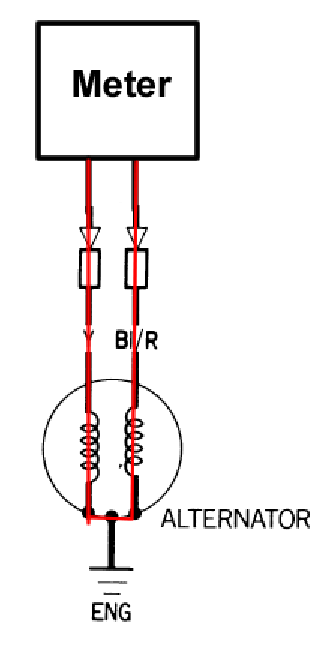 Anyway, 88 ohms is about perfect middle grounds for the spec range (50-150 ohms). Anyway, where did you get the exciter coil? Was it labeled as high output or something? If it's not a stock unit, it might not have stock readings. The only true way to test it would be with a special adapter for the multi meter to read peak voltage like most modern atv's give specs for (generally 100v min and kick start speed). I'm not sure if the stock CDI's can handle a higher output exciter coil, maybe it took out your CDI? Just thinking out loud. Just as an FYI, generally the lighting, exciter, and pulse generator coils are very reliable, they only fail from physical contact that breaks a wire or cause a short, or vibration wearing the insulation though shorting the coils out (lower than ohm spec when tested), vibration breaking a wire (no reading when testing), or overheating it by shorting it out or drawing too much power from it for too long, basically burns out the insulation and causes it to test as a short. Under normal use there's very little chance of them failing, but it can happen. There's a ton of sensors on cars that are based on coils (temp, crank, cam sensors come to mind) and they rarely fail too and get a lot more use than these atvs. I get wanting to have the best parts possible for your machine, but sometimes OEM is the best you can get, that's why they were made with those parts to start with. Anyway, do you still have the OEM exciter coil? If so do the same test on it, I suspect there's a solder point you had to unsolder to swap the wiring over, so that to the metal body area where it normally bolts to the engine would do the same test. Might be a bit of a pain, but if it tests good, might be worth while swapping it back into the engine and see if you have spark. Also be sure if you do or don't have spark now. Spark plug against the head with the wire hooked up and kick it over while looking at it. Should be a blue/white spark. Orange or red is a weak spark. Hopefully I didn't go in too many directions at once (that's how my mind works). Hopefully we can get down to a root cause for the no start issue. Forgive me for my mixture of terms, was going off the factory manuall, and aftermarket parts were listed as. Ok, first when I did the test I checked the yellow wire hooked to the multimeter, and other lead from the multimeter touching the frame. Did the same with the red black wire hooked to the multimeter, and other multimeter lead touching the frame. Thats where I got my reading on the multimeter which was in ohm mode auto. I was going off how the factory manual said to get the readings with a multimeter. So I was testing them one at a time, not both wires coming from the crankscase at the same time. I totally understood about the green wires or frame being the ground. Yes your correct I meant pulse generator, not cdi. It checked out ok. Yes I did swap the bulbs before and it didn't change the issue. It would light up realy slowly, and never get bright, even when engine rpm increased. It wasn't bright enugh to use at night time, kinda the brightness of a lit cigarette in a dark room. Thats why I changed the lighting coil with the ricky stator replacement. The exciter coil is also a ricky stator replacement. Here is the link. These are the exact ones I used. Here is a picture. Yes I do still have the original exciter coil, may take your advice and pull the new exciter out tomorrow and put the old one back in. So your saying the new lighting coil sounds good? The new wiring harmess is in good ahape, not brittle or hard like the original that came with it, that had been hacked on. Thats the main reason I swapped it out. Got another question. The newer harness has a blue and green extra female connections near the headlight plug, look the same as the ones for the tailight at the rear of the bike. What are they for? Extra? I really do appreciate all of your help, and am thankful I have your help chasimg down this gremlin. Alright I was probably just reading it wrong lol. I was hoping the sale page for the coils would list their spec, or if they should be OEM. Might be worth while contacting rickystator and ask them what their part spec should be in ohms. For the harness I suspect it's the main harness? Was it used, or new aftermarket? I'm the only one that I know of that makes aftermarket harnesses regularly for 3 wheelers, but I saw one person on ebay selling TRX250R harnesses that they made. Probably the best thing is to ohm test those extra wires to the handle bar control connector. Ohm test or put it to the beep mode (beeps when probes touch), and see if blue matches to blue, and green matches to green. Normally blue is brights for the head light, and green is frame ground, but if it was modified by someone, sometimes they throw wire colors at things willy nilly. I've seen a ton of 250r and 200x harnesses with the head light connector hacked off and replaced with spade connectors. Not sure why though, maybe to run the 350x headlight or something. Anyway, I don't see the extra connections on my stock OEM harness I use for reproducing harnesses. Since you had problems with the lights even after a new bulb I suspect it would have to be the alternator causing the problem (internal short). There's no regulator on the 200x, so can't put the blame on anything else. I'd assume if wires were shorted out, you wouldn't get any lights, but never done that before on these machines lol. Since there isn't an ohms spec for the lighting coil, a partially shorted one can't be tested for via the ohms test. The second best would be to take an AC voltage reading off it, same process but with the engine running. Idle should be something like 9v or so, and high rpm around 14v or higher since it has no load. If you got fancy and hooked up the lights while testing it, it shouldn't go higher than 15v, and a min somewhere around 9v, maybe less. Another fun job, but another option could be to swap your old harness back on the machine since the replacement one could have issues unless you know it's from a machine that ran. Harnesses can be tested, but it takes time, basically follow the wire diagram and make sure it has connection all the way though the harness, like black/red from stator area to CDI box. It's not too bad if you can follow the wire diagram, just a lot of probing (don't poke holes in the wires btw, always get connection at the terminals).